Produce and floods: A bad combination! 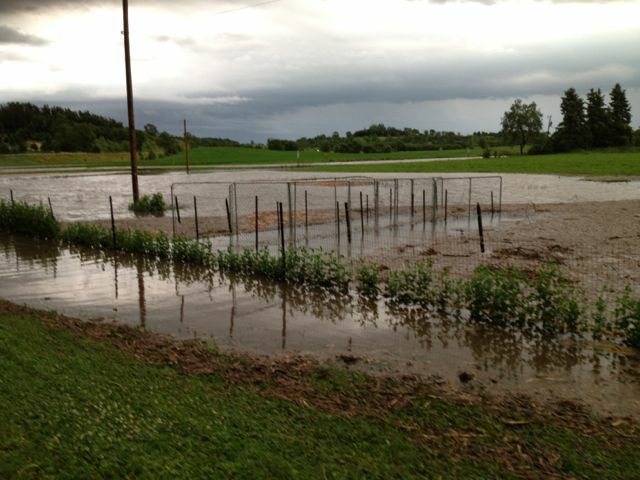 Flooded vegetable garden near Northfield. June, 2014. Portions of Minnesota have been inundated with rainfall and flooding in recent weeks. Unfortunately, floodwaters can be contaminated with all kinds of things, including raw sewage from septic systems or municipalities, manure from farms or fields, and chemicals or other contaminants. Why are floods bad for produce? When it comes to produce, it’s essential that gardeners understand that floodwaters can contain harmful microbes such as E. coli or salmonella that could contaminate produce. If any edible portions of produce were touched by floodwater, that produce may be contaminated and should not be considered safe to eat. Once bacteria or other pathogens contact produce, they can be nearly impossible to remove. Lots of fruits and veggies have rough skin (such as cantaloupe or strawberries) or folds (such as leafy greens) where pathogens can lurk. Contaminants may be present on the surface of fruits and vegetables or may be internalized through cuts, stem scars, or other points of entry. Remember that it’s always better to err on the side of safety when it comes to foodborne illness! Foodborne illness can affect anybody, but some people are at much higher risk of serious illness or even death, particularly children, older people, pregnant women, and anybody with a weakened immune system. For more information regarding flood contamination of produce, gardeners should refer to guidance from regulatory agencies such as the US Department of Agriculture (USDA), the US Food and Drug Administration (FDA) or the Minnesota Department of Agriculture (MDA). Visit Extension’s On-Farm Food Safety web page to learn more about produce safety and risk reduction practices, to find upcoming training opportunities, or to contact the On-Farm Food Safety team.